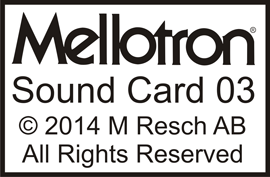 Sound Card 01 contains 100 Mellotron and Chamberlin sounds and it is permanently installed in all M4000D models. It is only available from mellotron.com and it contains 100 more Mellotron sounds. It is inserted into the expansion slot of the M4000D. Then you have 200 sounds for immediate access and that can be mixed independently in the playlists you create. Write to markus@mellotron.com if you want to order your card. Sound Card 03 is out now! It is only available from mellotron.com and it contains 100 more Chamberlin sounds, for example the rhythms from the Music Master Chamberlins, more lead sounds from the M series Chamberlins and many sounds from the Chamberlin library that weren't used in any instruments! we will have the next one out during 2015.